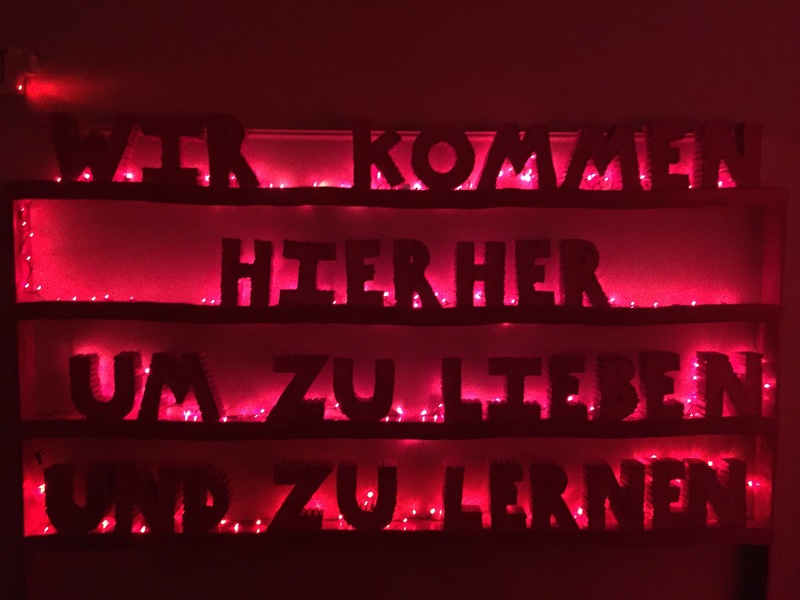 This piece is a scale version of a Public installation that will be a 9-10 ft. tall, 3-4 ft. wide, 500 ft. long sentence about love (in German – additional sentences to be constructed in other languages), painted bright red. Installed in two cities in the U.S. (San Francisco & Washington DC) and two cities in Germany (Hamburg & Munich). Supported by flags, colors of all countries. Installations can be temporary or permanent. 65.3 million people, or one person in 113, displaced from their homes by conflict and persecution (2015). An estimated 100 million people are homeless worldwide. As many as 1.6 billion people lack adequate housing. There are millions of children in foster care around the world who lack love and support. There are more refugees today than ever before in human history. We simply can’t ignore this crisis—arguably the greatest geopolitical issue of our time. HOW DO WE EVEN BEGIN TO RESPOND TO SOMETHING SO MASSIVE AND COMPLEX? We begin with a simple sentence that evokes and invites a deep conversation in our current international landscape. 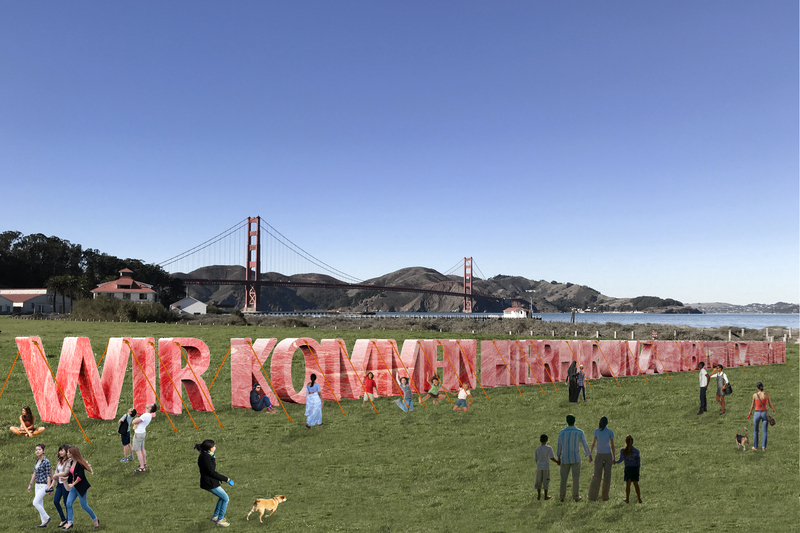 This project creates a real physical space for love in our landscape, calls for space in our hearts and minds, and engages us in creating moments of magic and places of rescue, physical places for loving and learning… a safe place to discuss why so many of us on planet earth are displaced and homeless, and to celebrate our collective journey here on earth. WIL KOMMEN HIERHER UM ZU LIEBEN UND ZU LERNEN – WHY THIS SENTENCE? The mother of the Artist was a poet and a writer. She wrote this before she died. This was her core understanding of why she had come to this earth, distilled in one sentence. The sentence speaks to a universal scenario for existence and offers a commonality among all humans. The sentence alludes to the traveler, in the broadest spiritual sense, and also to the sense of being a refugee – the “Other” – who seeks refuge and fulfillment of basic life goals. The sentence evokes a conversation about love that is deeply personal and spiritual, but also social and political. The 45th President of the United States has reduced the dialogue to the lowest possible level. Reactionary, anti-immigrant forces are gathering momentum worldwide. We must replace this horrible sentence with one that is much more powerful. We must supplant the compassion-less narrative with a message that speaks to everyone’s heart – because in one form or another – we are all refugees, we all have important migratory histories, and we all need each other. The project is devoted to drawing attention to the Others, to raising funds to provide refuge, sanctuary, care and love for the millions of Others around the world. This project will work in collaboration with the United Nations Refugee Agency, and other key international organizations working to provide refuge for the Others. Fascism, the organized force that exploits fear of the others, is on the rise around the world. As the number of refugees, slaves, homeless, etc. grow in the world, so does fascism. It isn’t a coincidence – there is a relationship between the forces that cultivate fear and the amount of suffering in the world. It is also evident that these same forces drive prejudice and violence towards women, people of color, and to the LGBTQ community. In order for discrimination of any kind to thrive, the idea of the “Other” is central. There is no Other. There is only Us. This project is Pro-Love and therefore inherently Anti-Fascist. Love welcomes the stranger. Love knows no limits. Love must stand up and fight for love. A key element of this project is to identify and promote common language that invites us to engage in a conversation about Love at a deeper level – to address the global Love Deficit in a demonstrable way. All humans need to be loved, to be safe, healthy and happy, to be healed, to find peace and calm, to connect and contribute, to enjoy a life filled with ease – these are core elements of the Buddhist Metta tradition, and can also be found in virtually every spiritual path. The earth is our refuge in the vastness of space – it is an extremely rare and beautiful gift, yet we are destroying it and ourselves at a horrifying rate. It isn’t a question of knowledge or resources that obstructs our evolution – it is the love deficit within ourselves. John Lennon said: “Love is the answer and you know that for sure.” However, this must be taught, demonstrated, modeled, and constructed. WHY IN GERMAN? WHY IN ANY LANGUAGE? America and Germany are both grappling with the problem of the “Others.” The intention is to discourage the conversation about the “Others” from descending into fear, discrimination, and violence. The historical precedents are foreboding reminders that in these times, it is vital to raise the conversation up, and not let it descend into chaos, or to become apathetic. Understanding something via another language brings a new light to the subject. Giving (actual-real) physical space to love. We dedicate physical spaces to parking cars, storing trash cans, hiding nuclear weapons, parks for dogs, zones for smoking cigarettes, etc., Why not give physical space to LOVE? By physically carving out space for love, we are literally and figuratively making more room for love in our lives, we are constructing love, grappling with the idea that love is structural, not just an ethereal emotion or concept.